Early in his life, Paul set a pattern of service that would stick with him for many years to come. As a youth, Paul helped area farmers with chores and field work near his hometown of Johnstown, PA. As a young adult, Paul’s desire to serve others took a different form as he volunteered for 1-W alternative service in the state of Oregon. Years later, Paul with his wife Irene, met with three other couples at the home of Sturgis & Bernice Miller to talk about a thrift store that might meet needs in Holmes County and beyond. That discussion grew into the beginning of Save & Serve in 1975. Paul remembers Roman Stutzman serving a vital role as the first manager of the store. Paul’s wife, Irene, did the initial scheduling of volunteers. After retiring as a teacher in the East Holmes School district, Paul has devoted some of his volunteer time to Save & Serve. He along with Wil Beachy served for a period of time as cashiers on Thursdays when the store added evening hours. Paul has also performed a variety of tasks with the processing of donations. Every Friday, when weather permits, Paul now picks up his former neighbors on Brown Ridge near Walnut Creek and they all come out to serve together at the store. Together they evaluate, clean, price, and stock the shelves of the store. The whole group likes having the opportunity to give of their time to meet the needs of others. 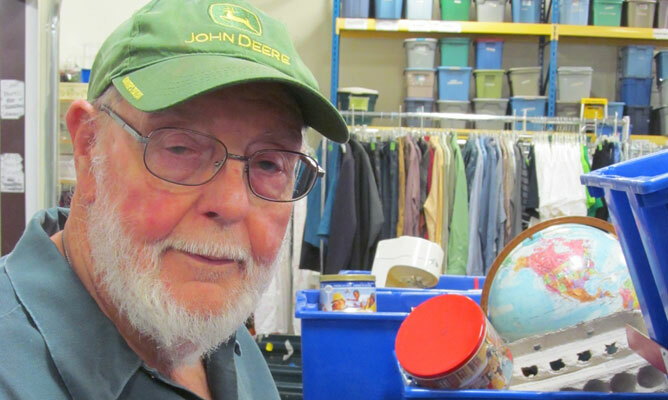 These needs are met through the savings of purchases in the store and also by providing relief around the world through support of Mennonite Central Committee. Paul enjoys working together to serve others. With his kind, warm-hearted nature, he has created many good friendships along the way.